Melanie Chirichella had been waiting a year and a half for a kidney transplant when she finally got the call from her doctors Saturday that they had found a perfect match in South Carolina. "It was like a miracle," the 64-year-old told The Associated Press. "When she called and said, 'We have a kidney for you,' I almost fell off the bed." But there was a problem: A blizzard was raging up and down the East Coast. The medical team would have to beat the elements and the clock to make sure the transplant surgery happened while the organ, taken from a brain-dead patient on Friday morning, was still usable. In the end, Chirichella got her new kidney, but it required a combination of daring and improvisation, maybe even a little recklessness. And more than once, it looked as if she and the organ might not even make it to the operating room. 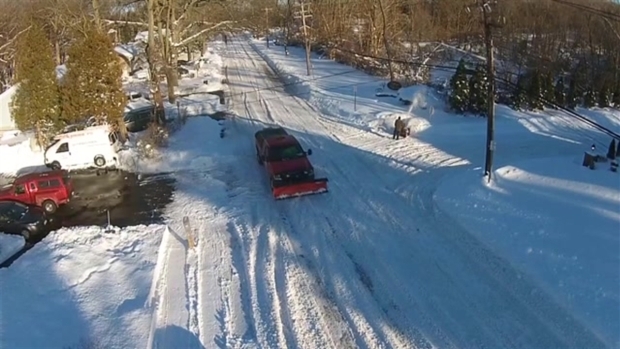 Video shot from a drone in Suffolk County, Long Island shows the Monday after the blizzard hit this weekend, Jan. 25, 2016. Aerials show Coram, Selden and Farmingville, New York. 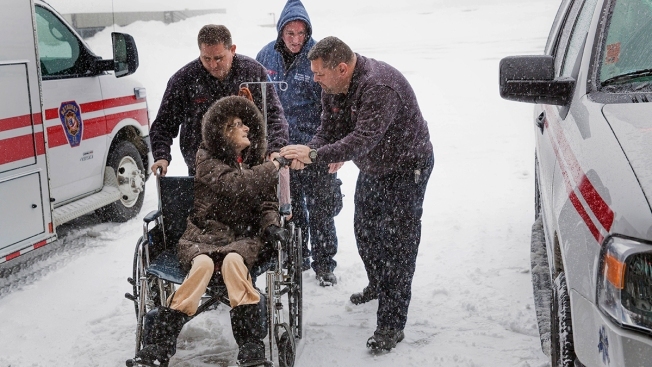 At first, emergency crews told her there would be no way an ambulance could navigate through whiteout conditions to bring Chirichella the nearly 20 miles from her home in Bohemia, New York, to Stony Brook University Hospital on Long Island. But paramedic Pete Amato was undeterred. A decade ago, his brother had received a lifesaving kidney transplant. He knew there wouldn't be time to wait. He hopped behind the wheel of a hospital SUV, turned on the lights and sirens and hit the road. "This needs to happen," Amato remembered thinking. "I knew the sense of urgency." Ideally, doctors try to transplant a kidney within 24 hours of its removal, but that can be extended to 48 hours under the right conditions. The kidney, plus a second one bound for a different patient at New York City's Presbyterian Hospital, had left Charleston, South Carolina, on a Delta flight Friday evening. The storm had already begun to disrupt air travel by then, but this flight got through fine. Airlines are informed when a transplant organ is aboard and the flights get special status to avoid delays. The organs ride up front with the pilots. The kidneys arrived at the New York City offices of the donation coordinator, LiveOn NY, at 9 p.m. Friday, just around the time the snow began to fall in New York. Then they had to undergo a battery of tests. Final results weren't available until 9 a.m. Saturday, when the wind was howling and the snow coming down hard. Driving was already treacherous. Wilson Li, an organ preservationist at LiveOn, was given the job of delivering both kidneys with the help of a driver from the medical transportation company TransCare. First stop was Presbyterian Hospital, perched high on a ridge in Manhattan overlooking the Hudson River. The SUV carrying the team got stuck trying to get up the hill and had to be pushed to the top by a city sanitation vehicle, Li said. After the delivery, they ditched the SUV and waited 45 minutes for an ambulance for the 60-mile drive out to Long Island. "It was really hard to see," Li said. "There was a lot of snow. A lot of wind." A lot of ice, too. They stopped every 15 to 20 minutes to de-ice the windshield because the wipers couldn't keep up. But they kept going, delivering the kidney to Stony Brook at 4:12 p.m. Meanwhile, Amato was delivering his own precious cargo — the patient. As he drove along the Long Island Expressway, his SUV was nearly hit by a tractor-trailer and he watched a Jeep spin out of control. "My fear was that someone was going to crash into us or that we'd get stuck," Amato said. After undergoing the 3 1/2-hour operation, Chirichella, whose original kidneys were damaged by diabetes, is recovering well, doctors said. On Tuesday, Amato visited Chirichella in her hospital room. As she saw him for the first time since he wheeled her into the hospital, Chirichella leaned over and kissed his cheek. Amato recalled the moment he arrived at her door in the snow to take her to the hospital. "I saw the look on your face — that shock when I got there," he said. "Somebody wanted us to meet."